a special discount code 101 for 10% off! Limited offer: one use per a customer. What are dog collars made of? 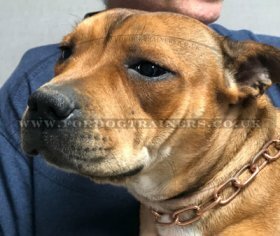 We propose metal dog collars are made of chrome-plated steel, stainless steel (inox), brass and curogan (hypoallergenic nickel-free alloy of copper and tin). 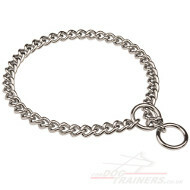 Choke chain dog collars by Herm Sprenger are proved by the International Quality Certificate. What types of dog collars are there? 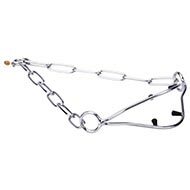 We propose dog chain collars made of various wire gauge and links form and length for short-fur dogs and long haired dog breeds. Learn how to measure a dog for a dog choke collar here: How to measure dog collar size. 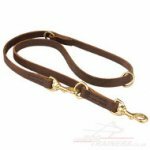 How to choose the best dog collar? Do not hesitate to Contact Us if you need any help or advice. We are always happy to help you. We will never leave you in a trouble until you are 100% satisfied with our products and service. Excellent service from purchase to rapid delivery thanks. Your service and quality of product is excellent. I regret ordering 2 collars from another company who sent the wrong sizes. I look forward to ordering from your company again soon. keep up the great customer service and providing great products. I will be recommending you to all of my friends and people at the shows I attend. Like the product and my dogs look pretty good in them. Thanks for using their pics, Jada and Tigger love the pics also. Absolutely! One super, nice collar. Extremely attractive and durable. I checked out many different companies and am very pleased with this collar. I bought two for my Golden's and they look so superior in them. You will be pleased when you order this collar. Also, received fast. What kind of dog collar should I use? 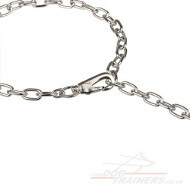 Chain choke dog collars are used for dog obedience training. 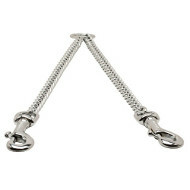 Large links of the chain at these collars let save fur on the dog neck. 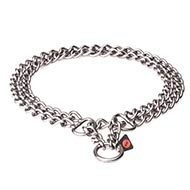 Short link collars are the collars of small chain links. They let fasten a collar quickly if a dog does not obey. 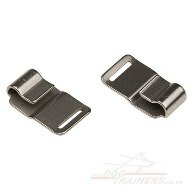 Pinch training collars with inner studs are intended for strict control over a dog. They are recommended for aggressive dogs. All these types of dog collars perfectly look on any dog as an accessory. 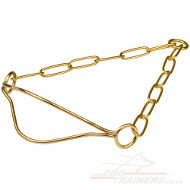 At our dog store you will find only the best quality metal collars made by a famous Herm Sprenger TM. 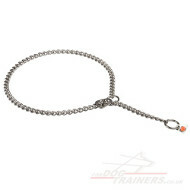 We have a great variety of metal dog collars. 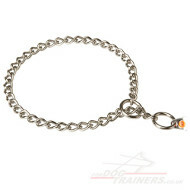 The first accessory you are looking for your dog is a dog collar. Read here what dog collar to use. 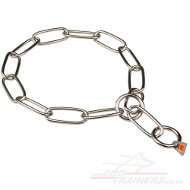 What does the market proposes nowadays and how to choose in the variety of dog collar types? What are dog collars for? 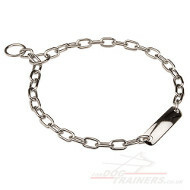 The choice of this necessary dog training equipment seems simple for the first sight. Lets view it closer. 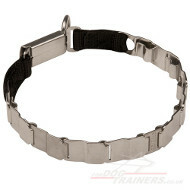 Read about dog choker collars types, features and intended use. 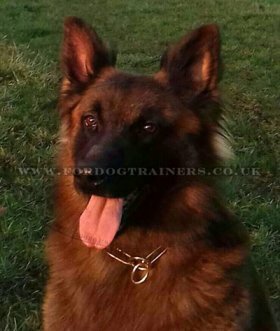 Dog choker collar is one of the most effective tools for dog obedience training and it may be very helpful for a trainer and handler. What kind of dog collar should I use: leather dog collars, chain dog collars and pinch collars for dogs. Comparative characteristics of dog collars types. Dog collars differ depending on the materials, characteristics and intended use. What are dog collars made of? Dog collars are usually made of leather, nylon or metal. 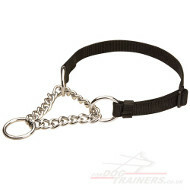 The dog collar area of use is very wide: from daily use to special service training. Read what collar is best for a dog. 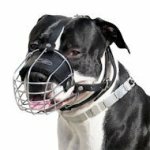 Let's review various points of view to the negative and positive features of dog choke chain collars and dog prong collars.